Choi Jeong Hwa’s “Happy Together” is still running for most of September. 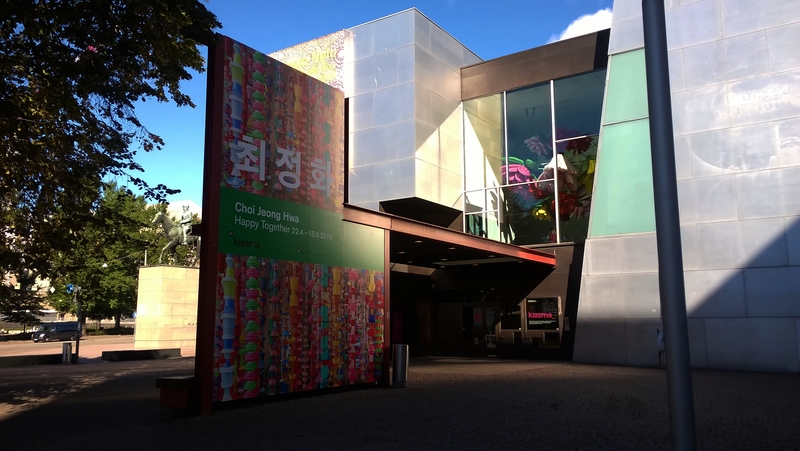 Jeong Hwa is one of the most famous contemporary artists in Korea: he is known for his eye-catching, colourful installations which combine Korean visual traditions with international influences. In “Happy Together”, he works primarily in plastic – mass-produced consumer goods and household goods plastics; cups, plates, bowls, colanders in bright colours; sometimes accented with recycled wooden, metal of glass elements and other materials. 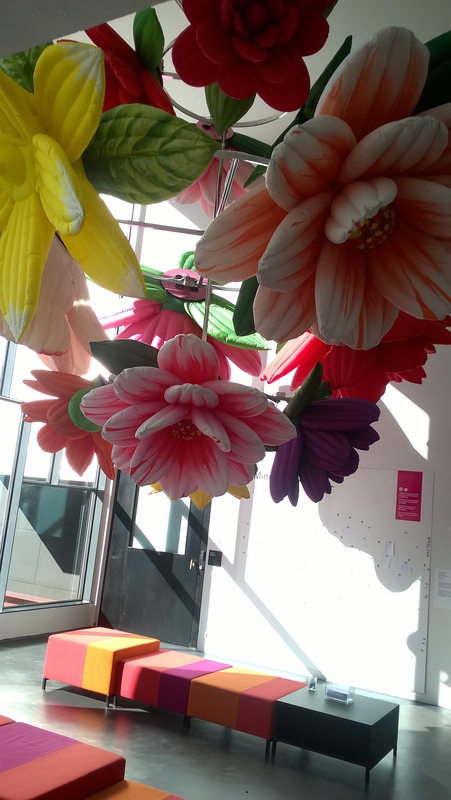 One of my favourite installations was the Flower Chandelier which is clearly visible from the outside of the museum – gigantic flowers suspended from the ceiling; the blossoms open and close their petals and move around on their “stems”. Beautiful. 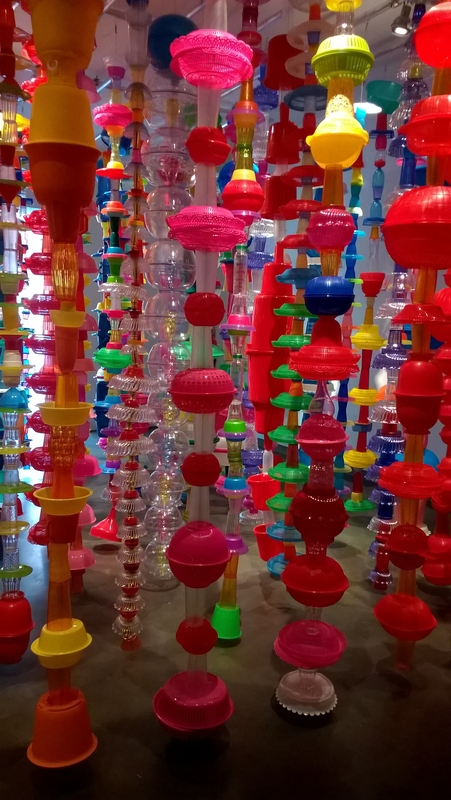 Another impressive installation are the ceiling-high “towers” of plastic kitchen utensils – a veritable forest of colours (see above). 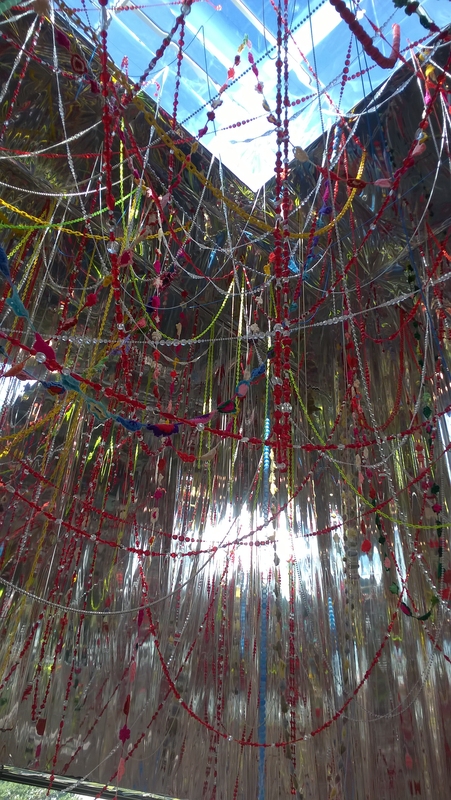 And in the next room hundreds of colourful plastic jewel chains were strung from the ceiling. 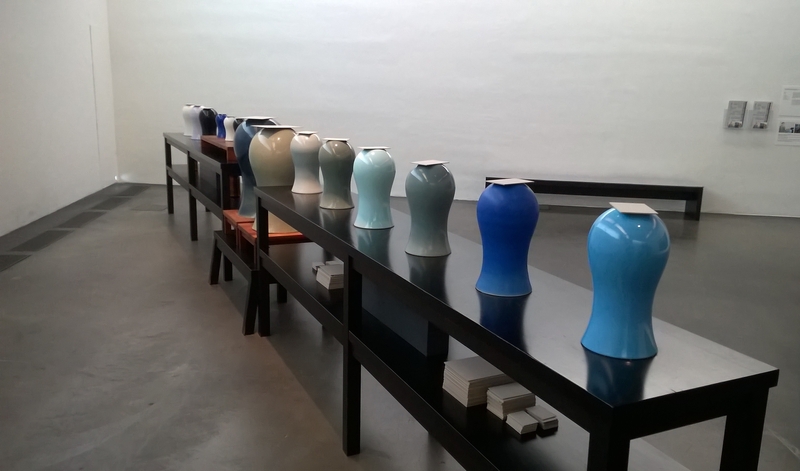 Of course I also visited Kiasma’s permanent collection. It’s a nice, compact museum, by the way, very accessible and easy to walk around. European museums are often located in historic buildings that have lots of stairs and few lifts – nothing against historic buildings, I love them! But I do enjoy the occasional bit of modern, purpose-built museum architecture. I also liked the fact that in each room there were little moveable wooden benches for children to climb on, so they can look at the exhibits properly. Nice touch. I was intrigued by the art works and installations on display (I know next to nothing about Finnish contemporary art but now I am hooked!). 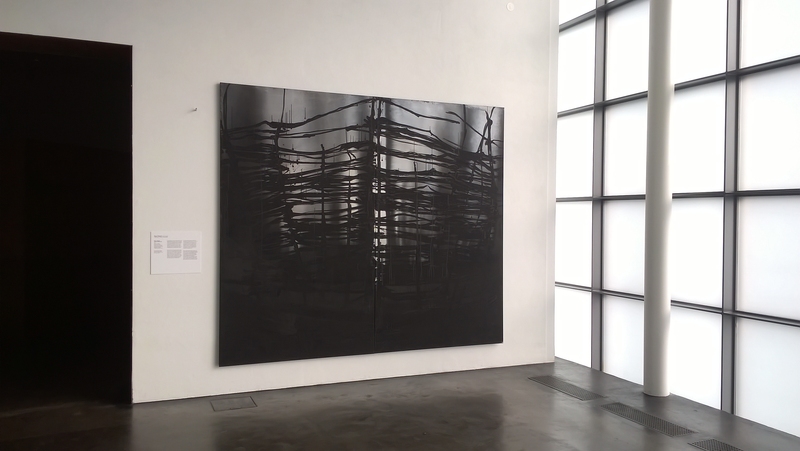 The painting on the pic below is by Finnish artist Anne Tompuri: “Raja I sarjasta Tiheän pimeän läpi” (Border 1 from the series Through Dense Darkness) from 2011. 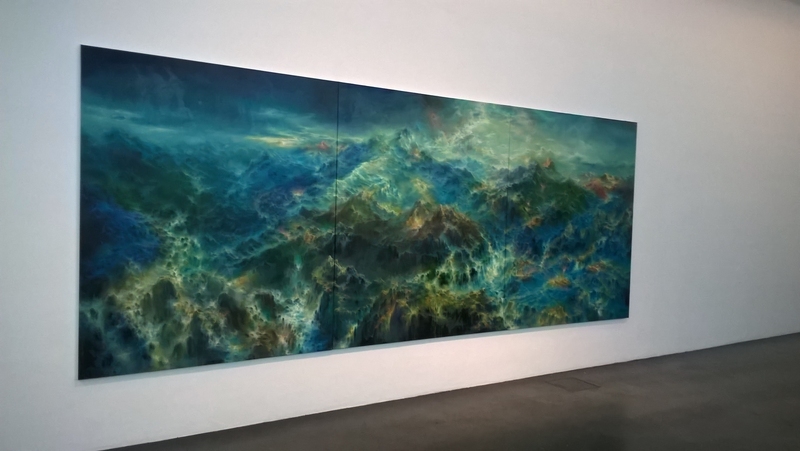 Very impressive; I would have liked to have seen the entire painting series – you can look at it on the artist’s homepage (position your cursor over the yellow word “painter” on the website). The sculpture/installation on the picture above is by artist Jouna Karsi, also from Finland. It is titled “Pohjanmaa” (Ostrobothnia), from 2014. The model is suspended from the ceiling, it depicts a fragment of the landscape of Ostrobothnia. Ostrobothnia is also called Österbotten (thank you Wikipedia); it’s a region in Western Finland near the coast of Gulf of Bothnia (Baltic Sea), very close to Sweden. It seems to be a very flat, stony landscape, with few trees and mostly fields. 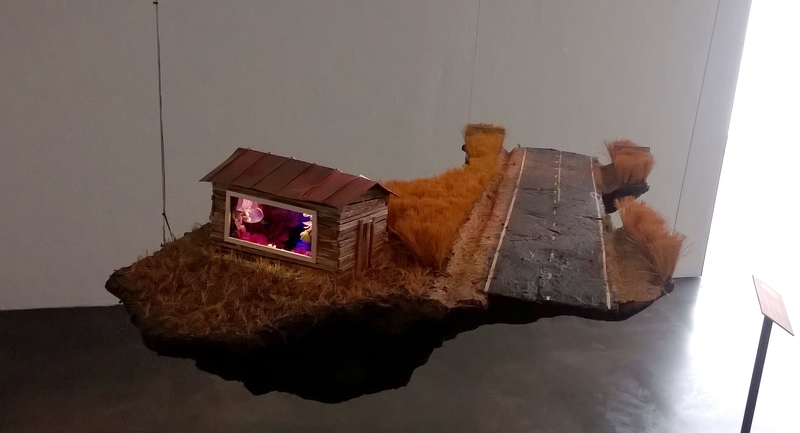 And this is exactly what Karsi’s sculpture conveys: an empty road, scrubby bushes on the right and left, a low wooden house. In contract to the depressing-looking landscape, the house is filled with bright plastic flowers – a surprising contrast. Very cool. 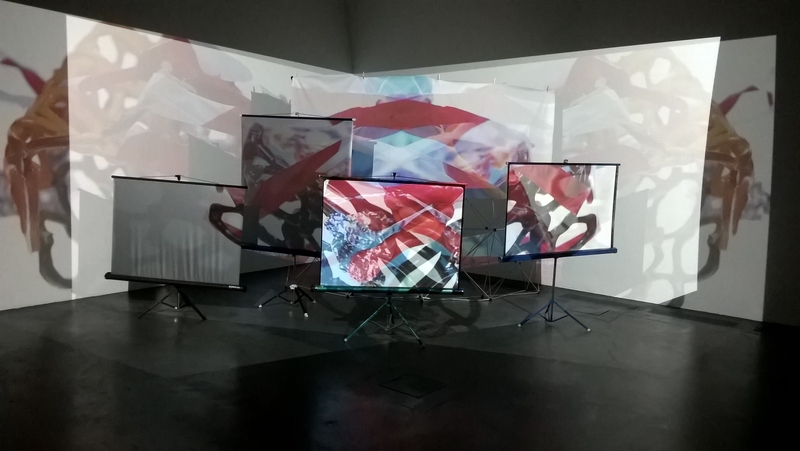 The video installation on the picture below is “Roskavideo” (Rubbish Video) from 2014, by Finnish artists Janne Nabb and Maria Teeri. The video shows slowly unfolding balls of screwed-up paper and plastic rubbish from the artists’ studio – it’s in slow-motion and quite hypnotic to watch. One of my favourite exhibits in the permanent collection was “Hinterland” by Finnish painter Petri Ala-Maunus (pic above) – an Alpine landscape seen from above; an explosion of blues, greens and whites. I read that Ala-Maunus is known for his large-scale ultra-romantic and über-kitsch paintings – I simply loved this one. I couldn’t find a website for this artist but here’s the link to his gallery. I also loved the interactive “Babylon List of Scents” by Danish artist duo Morten Skriver and Christian Skeel. The installation is from 1996: a line of ceramic jars filled with different naturally occurring fragrance ingredients/scents. We’re talking pure fragrance ingredients here, by the way, so several of them smelled very unpleasant indeed. Others were lovely. The jars were covered with removable pieces of cardboard so you could walk along the row of jars and smell each fragrance…there were 28 scents altogether: camphor, bitter almond, birch tar, lemongrass, orange, ylang-ylang, oak moss, civet, cedarwood, sandalwood, lemon, sassafras, labdanum, frankincense, rose, lilac, vanilla, hyacinth, lavender, jasmine, ambergris, castor, tonka bean, patchouli, cardamom, fennel and galbanum.